Hydrangeas are nearly as beautiful dried as they are in full bloom, maintaining a hint of color that looks just as great in a vase as it does in a wreath of dried flowers. These flowers are fairly forgiving when it comes to the drying process, as well. No matter which drying technique you choose, hydrangeas will retain their dried color indefinitely. 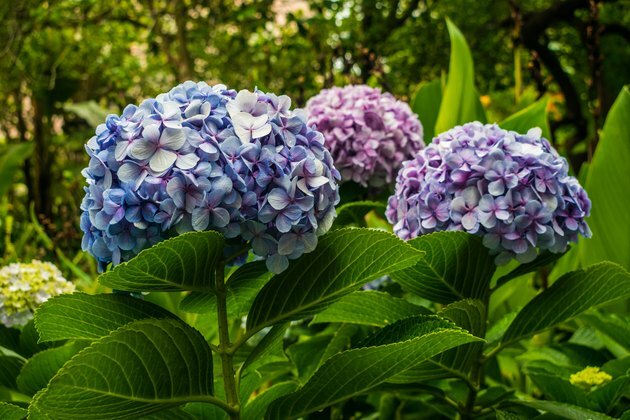 While hydrangeas show off the most colorful versions of themselves while in full bloom, this isn't the best time to cut them for drying. If cut during peak bloom, they tend to wilt or brown rather than turning a desirable pale hue. On a dry day after the dew has evaporated, pick a bloom that has already displayed its brightest color and is just starting to fade. The color will vary depending upon hydrangea variety and where it is planted. You'll know the time is right when some of the petals are pale green, pink, cream, burgundy or light blue—different than the plant's peak color. At this point, the bloom's petals should feel a bit papery compared to a younger bloom. If it doesn't feel papery yet, pick another that does, or check it again in a day or two. For best drying results, snip the stem straight across with garden shears so it is no more than 18 inches long, then remove any attached leaves. Hydrangeas can be dried several different ways, including the classic upside-down method used to dry herbs. Hanging them upside-down is not necessary, but it is a good option if the flower's stems are weak and thin. Group several cut hydrangeas together with twine, tying them together low on their stems. Hang them in a cool, dark place for several weeks to dry them out completely. They're ready when all the petals feel papery and the stems feel like twigs that might snap if bent. Placing the cut hydrangea blooms in a vase with water allows them to take their time drying, which helps preserve some of the color, too. 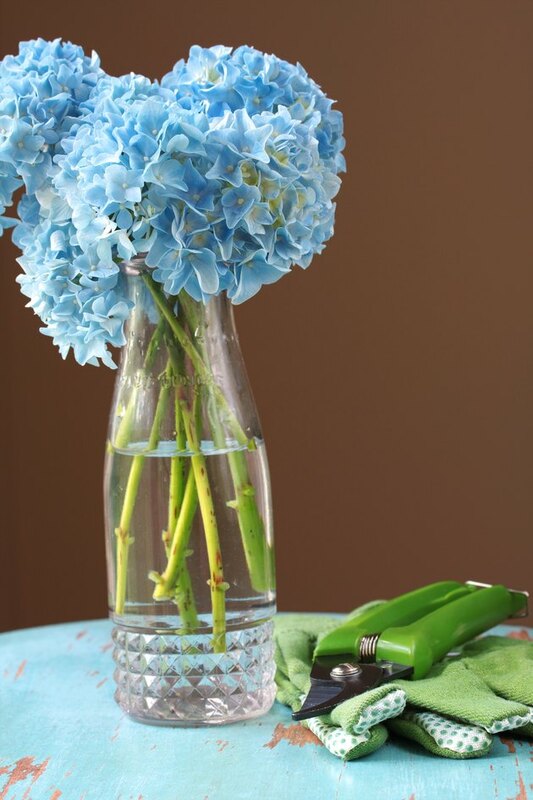 Fill the vase halfway with water, or up to half the length of the cut hydrangea stems. Place the cut blooms in the vase, and set the vase out of direct sunlight but in a place where you can enjoy their looks. The blooms are dried and preserved once all the water has been absorbed, which could take a few weeks, depending upon the humidity and the amount of water in the vase. 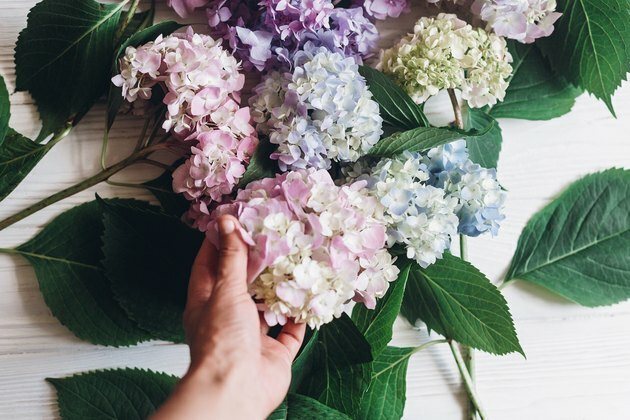 Display the dried hydrangeas in vases on their own or as part of other dried arrangements to add a bit of nature to your home's interior, no watering or plant care required. Glycerin makes the blooms turn brown. A mixture of glycerin and water preserves hydrangeas in a way that keeps them a bit more soft and supple than when air dried. The blooms may turn a bit more brown this way, as well, which gives them a bit of a vintage look that is well-suited for displaying amid antiques or in country-craft displays. Mix two parts tap water with one part glycerin in a jar or vase, stirring until well blended. Mix enough to cover the hydrangea stems at least a few inches within the chosen vessel. 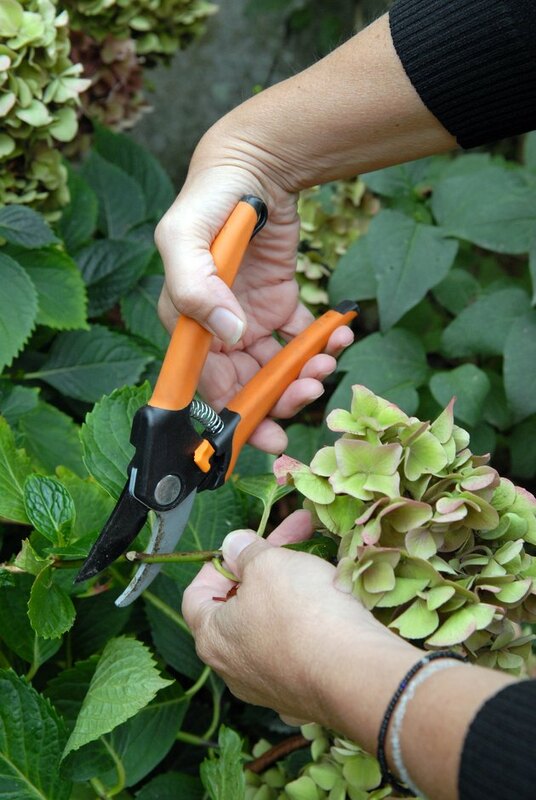 Hold the stem of one hydrangea over the edge of a workbench so the bloom end is hanging off the surface. Whack the end of the stem with a hammer so the stem breaks open. This helps the plant absorb the glycerin solution. Do this with each cut stem. Place the hammered stems in the vase or jar, as if making a flower arrangement. Once the solution has been completely absorbed by the hydrangeas, they're dry. As the stems pull the glycerin and water through the plants, the water evaporates through the petals while the glycerin stays in them, resulting in a somewhat soft bloom. If working on a project such as a floral wreath, weave the hydrangea stems into their wreath form soon after trimming them, instead of waiting until the flowers are completely dried out. The stems and blooms are stronger and more flexible when they still contain moisture. Damage may occur if you try to bend and shape the stems once they're completely dry. Hydrangeas that dry naturally on their plant are still worth cutting and saving. They may be less colorful and more fragile than purposely dried blooms, but they'll still retain their shape if handled in a gentle manner. These dried, somewhat dull blooms can also be dressed up with floral paint. This spray paint comes out of the can in a fine translucent mist, giving it a somewhat realistic look when used on a flower of similar color. To use the paint, shake as directed on the can, then spray a mist over the flower heads outdoors on a non-windy day. Hold the can 12 to 15 inches away from the bloom for best results. Try small spritzes of paint first, to add hints of color; you can always add more to give the flowers the look of fresh blooms. 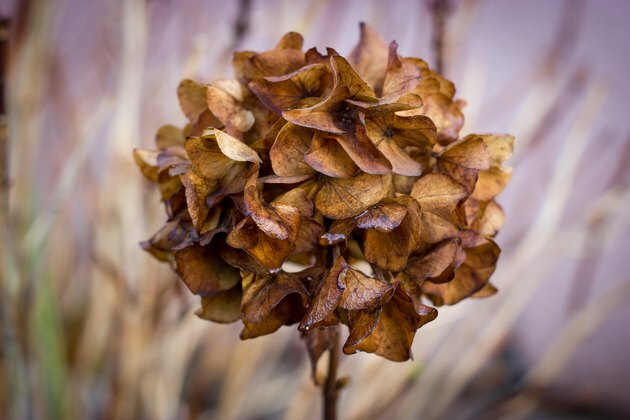 Even though you can save dried hydrangeas indefinitely, they may lose some of their petals or collect dust over time. Once they start falling apart, it's best to start fresh, adding the old ones to a compost pile.